From the Old French name Héloïse, which is probably from the Germanic name Helewidis, composed of the elements heil “hale, healthy” and wid “wide”. It is sometimes associated with the Greek word ‘ηλιος (helios)“sun” or the name Louise, though there is not likely an etymological connection. 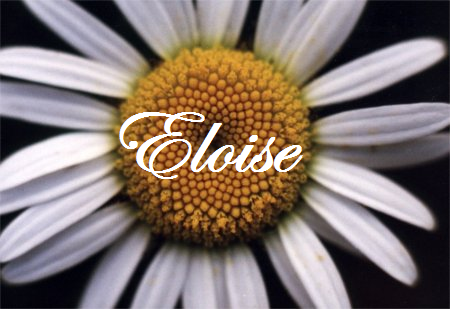 This name was borne in the 12th century by Saint Eloise, the wife of the French theologian Peter Abelard. She became a nun after her husband was castrated by her uncle. There was a medieval English form of this name, Helewis, though it died out after the 13th century. In the 19th century it was revived in the English-speaking world in the form Eloise.